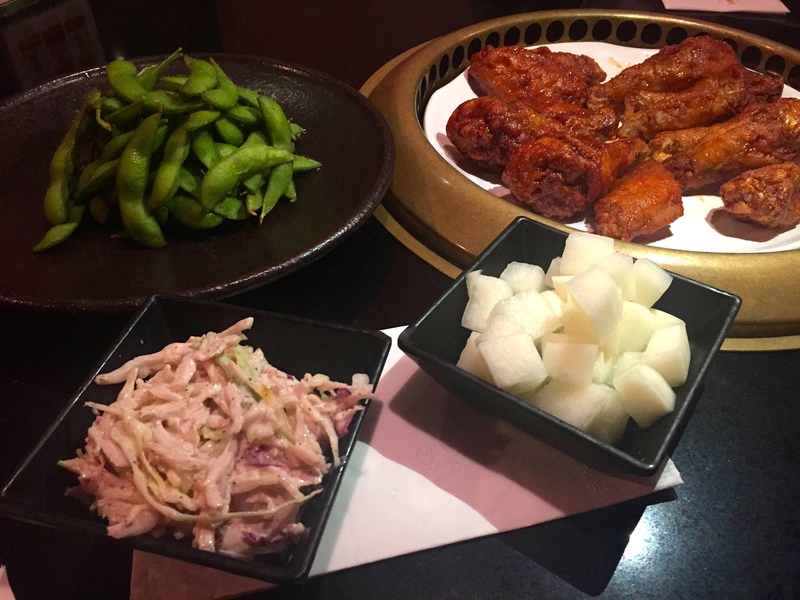 As a Korean from Orange County, California, I have frequent cravings for my Korean-style chicken wings. When I heard good things about BonChon Chicken, “excited” doesn’t even begin to describe how I felt. I made plans to eat dinner there with my fellow Korean friends who were also originally from Orange County, and we were all anticipating a night to finally satisfy our longing for some food from back home. The place was pretty full when we arrived, which I took as a positive sign. The wait wasn’t unreasonable for a party of three, although the waitress couldn’t give us the approximate wait time. After about 15 minutes, we were seated, and I took in the surroundings as we were given our menus. I could see that BonChon obviously wanted to create an “oriental” atmosphere with its red seats and overhead lamps. There was also a grill in the table for Korean barbecue – something that I’m looking forward to using soon. About five minutes later, the waitress returned to take our orders. We had Edamame as our appetizer, and a medium-sized Half-and-Half Soy Garlic and Spicy Chicken Platter (10 pcs) as our main dish, which the waitress had recommended for our party of three. The prices were reasonable, although they weren’t on the cheap side ($5.95 for Edamame, $20.95 for the platter). What I found interesting was that our main dish actually arrived earlier than our appetizer, but the wait times for both were normal. We were also given radishes and a salad as sides for the main dish. I first had the salad, which – as you can probably see from the picture – had too much mayo. It also had too many spices, which made a very strange combination that did not impress me. The edamame was better, but it was a bit overcooked. But, I really liked the radishes. They were crisp and refreshing, just as radishes should be. I then tried the Soy Garlic chicken. The outside was crunchy, and the inside had a nice texture. The garlic was thankfully not overpowering at all, but instead complimented the chicken well. The Spicy chicken was very, very spicy. People who really love spicy food will definitely enjoy this dish – as for me, a person who can’t handle super spicy food, I couldn’t finish the chicken wing after one bite. Overall, I felt underwhelmed. This might be because Orange County offers so many mouthwatering Korean-style chicken wings (if you ever come down to Orange County, you MUST try out Flying Chicken Pa-Dak), but BonChon was just “meh.” It wasn’t bad, but not particularly amazing, either. I’ll come here again to check out the Korean BBQ, and maybe once in a while to satisfy future Korean-style chicken cravings. 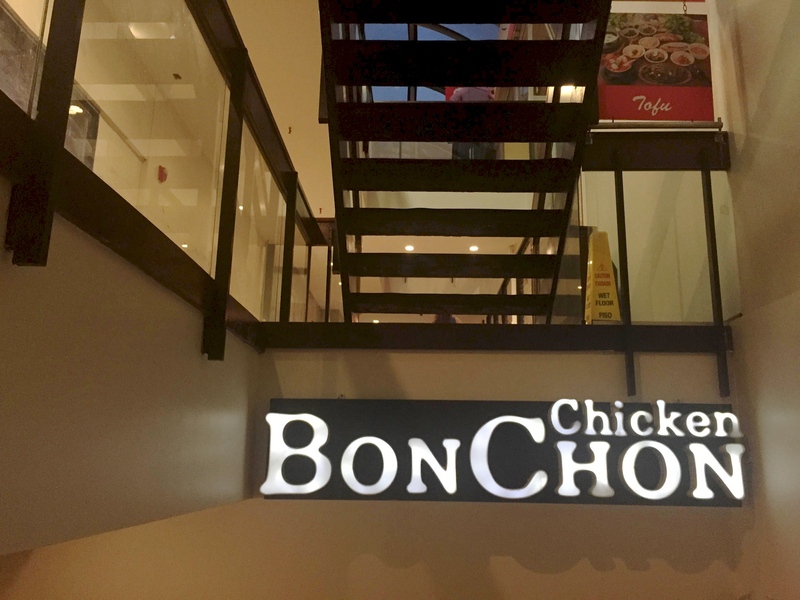 For those of you who have never had Korean-style chickens, I’d recommend you to try this place out, only on one condition: Think of BonChon as an introduction to the amazing world of Korean food, but remember that it can get so much better.